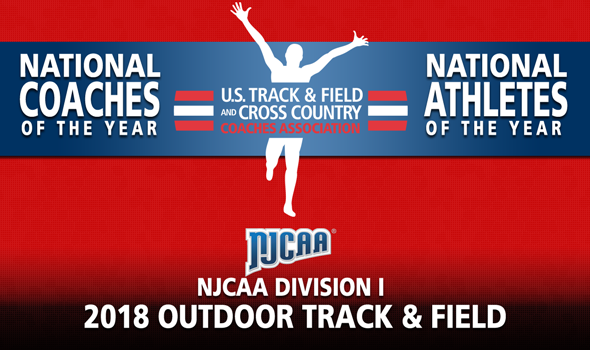 NEW ORLEANS — National Athletes and Coaches of the Year for the 2018 NJCAA Outdoor Track & Field season were announced Wednesday by the U.S. Track & Field and Cross Country Coaches Association (USTFCCCA). These awards were voted on my USTFCCCA member coaches based on performances both at this past weekend’s NJCAA Division I Outdoor Track & Field Championships as well as performances throughout the entire regular season. Information on each of the winners can be found below. Mosito was difficult to beat when it came to distance events this year. The sophomore from Mogale City, South Africa, took home two NJCAA Division I titles, running a 15:10.50 in the 5000 and a 31:32.68 in the 10,000 while also placing third in the steeplechase with a time of 9:26.76 for a total of 26 points. Mosito also won Region VI titles in the 5000 and 10,000. His season best in the steeplechase of 9:25.81 ranked third on the NJCAA Division I Descending Order List, while his top times in the 5000 (14:42.51) and 10,000 (31:22.57) both ranked fourth. Mosito becomes the first men’s athlete to capture Men’s Track Athlete of the Year honors during the outdoor season from Cloud County (Kan.) CC. Cohen was simply dominant during her freshman campaign. The product from Israel totaled 32 points for the Tritons by winning the 1500, 5000 and steeplechase while anchoring the second-place 4×800 relay team at the NJCAA Division championships. She was just as spectacular during the regular season, breaking the Israeli national record in the steeplechase with a time of 9:52.37, winning the Drake Relays in the process. She also broke the NJCAA 5000-meter record with a time of 16:07.03 at the Kansas Relays, also doubling as an Israeli national record. Cohen joins Leanne Pompeani (2016) as Women’s Track Athlete of the Year winners during the outdoor season from Iowa Central CC. Lawrence had a season for the ages this year, helping his squad capture a national title. The native of Westmoreland, Jamaica, recorded the seventh-best shot put mark in NJCAA history at the outdoor championships with a throw of 18.55m (60-10½) while placing second in the discus with a toss of 52.10m (170-11). He won every single shot put competition this season outside of the Texas Relays while breaking the Region VI record in the event with a throw of 18.20m (60-4). Lawrence becomes the second-consecutive athlete from Barton (Kan.) CC to capture Men’s Field Athlete of the Year honors during the outdoor season, joining Ricky Nelson Jr.
Brown rewrote the NJCAA record book this season for the Vaqueros. The product out of St. Catherine, Jamaica, notched the third-best shot put mark in NJCAA history at 16.37m (53-8½). She also totaled 21 points at the national meet for her squad, winning the discus with a throw of 50.36m (165-2) while also placing third in the shot put and fourth in the javelin. At the Region I Championships, Brown was virtually unstoppable, winning titles in the shot put, discus and hammer throw while also finishing second in the javelin. Brown becomes the first women’s athlete to capture Women’s Field Athlete of the Year honors during the outdoor season from Central Arizona. Schenek, in his 11th year at Barton (Kan.) CC, guided the Cougars to the NJCAA Division I outdoor championship this year, as the team totaled 128 points to snap South Plains’ 11-year outright reign on the title. The Cougars took home national titles in the 4×100 relay and shot put while also finishing in the top-eight in 13 events. Schenek’s squad also won the Region VI title. During the regular-season, the Cougars posted 24 top-10 NJCAA Division I Descending Order List marks under Schenek’s watch. Schenek becomes the first coach from Barton (Kan.) CC to pick up Men’s Head Coach of the Year honors during the outdoor season. Blackwill led the Thunderbirds to its second-straight outdoor championship, totaling 139 points. His squad was ranked first in all but one week across the regular season in the USTFCCCA National Team Rankings. The Thunderbirds totaled 22 national qualifiers under Blackwill’s tutelage, and his athletes were tops in NJCAA in the 100, 4×100 relay and long jump during the season. He also totaled three top-seven 100-meter runners, three top-five 200-meter runners and two top-six 400-meter athletes. This is Blackwill’s second-straight Women’s Head Coach of the Year award during the outdoor season, and his second overall this year, as he was also named the Women’s Head Coach of the Year during the indoor season. Blackwill was also the Women’s Head Coach of the Year during the indoor season in 2017. Henry, who coaches hurdles, jumps and the 400 meters, played an integral role in Barton (Kan.) CC’s run to the national title this season. Henry’s athletes accounted for 44 of the Cougars’ 128 points at the national meet, with 26 of those points coming in the hurdles alone. At the Region VI Championships, his athletes totaled 86 of the tea’s 213 points, and his men won three individual titles there. Heading into the national meet, Charlie Forbes and William Watson owned the top 110 and 400 meter hurdle times in NJCAA this season. Henry becomes the first Men’s Assistant Coach of the Year during the outdoor season from Barton (Kan.) CC. Williams’ athletes achieved 21 national qualifying marks across the season. In her seventh year at Western Texas coaching sprints, hurdles, jumps and mid distance, Williams led her athletes to 13 top-10 NJCAA Division I Descending Order List marks, as well as 19 top-10 marks in the region. She had athletes that led the nation 400 hurdles, 4×400 relay and high jump this year. Abigail Kwarteng, a three-time USTFCCCA National Athlete of the Week honoree, set a national record for Ghana in the high jump with a mark of 1.87m (6-1½). Williams becomes the first Women’s Assistant Coach of the Year during the outdoor season from Western Texas, and she also becomes the first woman to capture the award.